- Everybody is aware of Michigan State's defensive prowess, but offensively they have come amazingly far in a short period of time. If there was a knock on QB Connor Cook last season, it was he wasn't overly accurate (he completed 58.7 percent of his passes last seasons, less than 53 percent the year before). He is right on target tonight. Actually, his accuracy has been uncanny. - People can dismiss Jacksonville State, but I have seen the Spartans struggle against Football Championship Subdivision (FCS) competition early in the season before. The opener vs. Youngstown State in 2011 comes to mind. 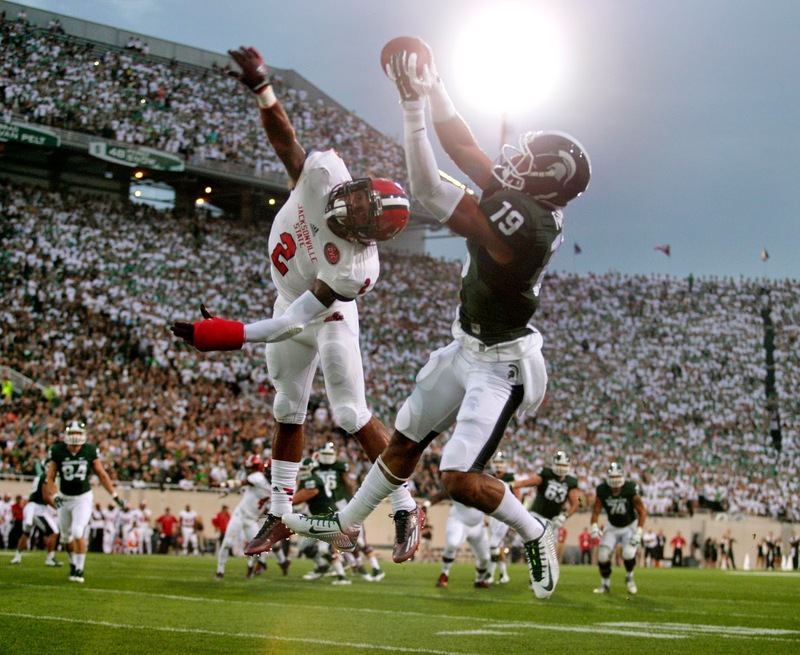 - For years, the wide receiver position group had been a weakness for MSU. Now it is a strength. Pretty soon, they will be calling him Big Play Tony Lippett. What an incredible first quarter. - OK, so it is just the season opener against less-than-threatening competition, safety Kurtis Drummond sure looks like a first-team All-American tonight. - I know Jeremy Langford is a terrific running back, but it looks like Nick Hill is going to nonetheless push him for playing time. Hill was very impressive during the first half.